Do you own a trucking business? Are you the head manager of a shipping warehouse? Whether you're an owner, manager or an owner and operator, owning or running a business takes a lot of work. Ultimately, as the person in charge, you're responsible for the success of the business. And when it comes to success and the bottom line, numbers matter. Businesses that transport and weigh goods depend on the accuracy of numbers to determine profit and loss. Investors and vendors expect your numbers to be spot on, which is why daily tracking and recordkeeping needs to be impeccable. Making sure numbers are always accurate means starting off with the right tools. It doesn't matter if you're receiving goods onsite or weighing loads on the go, it's essential that your business' numbers are accurately recorded for charging and inventory. That means purchasing high-quality truck scales and portable truck scales. An inaccurate scale can detrimentally affect inventory tickets and pricing. How can you ensure that you're purchasing the right tools? If you aren't sure what truck scales are best for your business, visit with a Floor Scales Direct customer service representative to determine the best type of scale that will work right for your business. We sell superior scales, so you can work with the best! It's also important to note that there are different floor scales for a variety of weighing needs. While you may weigh the majority of your goods or vehicles onsite or at one central location, there are often times when it's necessary to have portable truck scales that can take care of on-the-go weighing needs. With a high-quality portable truck scale from Floor Scales Direct, you can ensure accurate multi-axle weighing by connecting up to six scales. From truck weighing to custom applications, highly accurate scales ensure your numbers are on target. 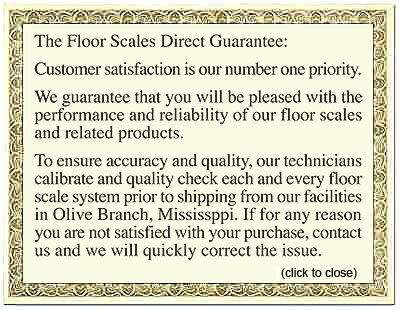 FloorScalesDirect.com offers a large selection of quality truck scales. We offer portable truck scales, livestock scales and a large selection of industrial scales.